Every year, just before the annual fall meeting of the BCG Board of Trustees, BCG presents a free lecture series at the Family History Library. And, this past Saturday, three Board-certified genealogists — The Legal Genealogist among them — offered some of our thoughts and the lessons we have learned to our fellow genealogists, including the staff of the Library. • Using evidence creatively doesn’t mean creating evidence! It means thinking about the evidence in new and different ways. Following family members or friends, associates and neighbors rather than the person we’re concerned with, or focusing on what’s known about the personality and character of the person to discern what he’d be likely to do in a situation are examples of creative thinking. • While direct evidence is what we all hope for, thinking creatively about indirect evidence and negative evidence — and applying concepts from other fields including climatology, geography, law and more — can solve many many more of our research challenges than we’ll ever solve by merely continuing to hunt for that elusive piece of direct evidence. • Every detail matters. Even the most mundane, seemingly-insignificant detail can provide a clue to solve a perplexing research challenge. Connecting the dots between two apparently unrelated pieces of trivial detail may offer the solution we’re looking for. • Effective research takes us beyond merely collecting names, dates and places — the “facts” — and requires us to interpret and correlate the data. Looking for patterns, both in terms of patterns that match and patterns that don’t, looking for new ways of thinking about the records we already have can be more useful than looking for more records. • Maps — and the words and notations written on maps — aren’t neutral. Maps were created for a reason, and what was put on them was intended for a purpose. A map by a steamship company might exaggerate the dangers of traveling on land, just as one example. • Maps can be used for many purposes, and key among them are to influence people (that’s why they’re not neutral); to correlate data, a great use we can all make of maps as genealogists; and to elicit and preserve data. Ever think about asking a relative to, say, map the neighborhood where he or she grew up? What a great idea!! • A research plan for a life-changing event begins with a thorough understanding of the event itself, together with an identification and a deep understanding of the key players — the individuals to be researched. Their actions, inactions, motivations and prior history are what contributed to the event. • It’s not African-American research. It’s American research. The story of slavery is the story of all Americans, north and south, whether our ancestors were slaves, slaveowners, or merely onlookers to this peculiarly American institution. • It isn’t possible to understand the records of the day without understanding the law. If we don’t understand that a newly freed slave was often legally required to leave the state, leaving family behind, it’s impossible to understand why that freed slave might want to be sold back into slavery. Sounds like a great round of presentations, Judy! Thanks for sharing the highlights. 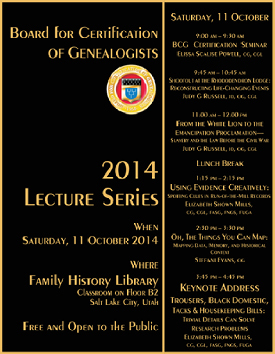 Sounds like some great talks and it would have been wonderful if they had been recorded and offered to the entire genealogy community. Some of these presentations have been given at national conferences and those earlier versions may be available on audio tape. Check out Jamb Tapes. Awesome points! Oh how I WISH I had been able to attend. The presentations all sound so FABULOUS. It was a joy for me to be able to listen to Elizabeth and Stefani, Sara! Attended both lectures by Elizabeth Shown Mills, only to find out I was already doing all of these she tell us to do, for years. I was hoping to find what new ways to try. Glad to hear you’re already working, consistently, at such a high level. Me, I still learn something new, get just a little different handle on something, every time I hear one of these lectures — even if I’ve heard the lecture before! It’s exactly that kind of law that we have to understand — in the context of its time and place — if we hope to begin to understand the records. I didn’t know slavery was a “peculiarly American institution” … African slavery started in the early days of the sugar trade in the West Indies by the British (nothing to be proud of there, speaking as a Brit), and then extended to the mainland. Before that, of course, the first “slaves” (indentured servants) to the colonies were from the British Isles, not Africa. And of course, slavery existed for millennia before that in the Old World … And, shamefully, is still in existence today in many parts of the world. So NOT a peculiarly American institution! Although slavery itself was hardly unique to America, the particular form it took here from a legal standpoint was of our own making and not particularly like the legal structure elsewhere. It was very different from British precedents, very different indentured servitude, very different from the French Code Noir, very different from Roman legal concepts. In other words, we took an existing idea and made it our own.